Some of you may know I‘ve been looking at systematic error in the surface air temperature record . My interest is in basic instrumental error, which complements the great and more exhaustive work Anthony Watts and Joe D’Aleo are doing. But anyway, looking at instrumental error in surface temperatures made it seem like a good idea to have the global average surface air temperature data sets, just for reference. You never know when they might come in handy. I already had GISSTEMP 2007 and 2010 from the GISS website , and the CRU 2005 data downloaded from the Carbon Dioxide Information Analysis Center (CDIAC) . But getting prior data sets also seemed like a good idea. As you might expect, they turned out to have interesting properties. I wanted the as-published data sets, and so just digitized them directly from the published graphics: GISS 1987 , 1988 , 1996 , and, 1999 , and CRU 1994  and 2003 . The years are the publication dates, so the data sets end a year or two earlier. In every case, I digitized only the unsmoothed data and every digitized point was centered in the published point. Given the resolution of the published graphics I estimate a digitized precision of about (+/-)0.002 C.
The GISS 1996 global anomaly trend shows that 1988 was fast approaching the 3-sigma mark, which may have stoked his confidence. But the entire basis for the 99 % certainty Jim Hansen swore to before Congress rests on canonizing 1951-1980 as the definitive bench mark of natural variability for the last several thousand years of Holocene climate. You can judge for yourselves, but I see it as scientific nonsense. Anyway, once the all the data set were in hand, it seemed like a good idea to compare the earlier published trends with the later ones. You wouldn’t be reading this if the comparisons didn’t turn up interesting stuff. Here it is. One non-critical discovery was that the GISS 1987 anomalies were accidentally plotted with a positive 0.1 C offset from zero. Otherwise, the 1987 anomalies are identical to the GISS 1988 set. Both data sets were zeroed to the 1951-1980 mean, so the offset isn’t due to different normalization schemes. Hansen and Lebedeff 1988 didn’t mention anything about the offset error published in Hansen and Lebedeff 1987, and neither paper had an attached corrigendum as of 1 May 2011. Maybe the authors decided everyone would just figure it out. But anyway on to other matters: Figure 1 shows the GISS global average surface air temperatures as published in 1988 and in 1999. The two trends seem to overlay pretty well, except maybe around 1880-1890. Figure 1: GISS global average annual surface air temperature anomalies, as published in 1988 and 1999. The differences between the 1996-1988 and 1999-1988 data sets are plotted below. At the bottom of Figure I plotted the difference in the trends: 1999 minus 1988, and 1996 minus 1988. The difference plots show that, between 1925 and 1988, the 1996 and 1999 global temperature trends were not very different from the 1988 trend. But in 1996 and 1999, the years 1880 to 1925 became warmer than they had been in 1988. And in 1999 the years 1880 to 1920 became even warmer than they had been in 1996. This is anthropogenic global warming that truly exceeds natural variability. We all know that we’re living in a warmer world. But heating the early 20th century record reduced the apparent rate of 20th century warming. In 1988, the 1880-1988 average rate of warming was 0.55 C per century, while by 1999 it was only 0.48 C per century (and only 0.41 C between 1880-1988). If the warming rate was 15% slower in 1999 than it was in 1988, wouldn’t there be less reason to worry? Why the change to a warmer past? That’s true, but only because the 1964 anomaly has a large down-spike, while the 1880s start with a large up-spike. Maybe H&L got some criticism about choosing a convenient 1960s starting point, because no such statement appears in the 1996 GISS temperature anomaly paper. But in 1999, we find evidence of renewed assertiveness right in the abstract: “<em>The rate of temperature change was higher in the past 25 years than at any previous time in the period of instrumental data.</em>” Twenty-five years before 1999 is 1974, and 1976 was again at the bottom of a large anomaly down-spike. That helps too. The bias effect of the 1964 starting point is pretty obvious (column 2 vs. column 3), so out the window it goes. Year 1960 seems a much less biased starting point for a comparison of warming rates because, like 1880, 1960 starts the decade at the <em>top</em> of an anomaly spike. But by 1996 (row 2), 0.017 degree of warming per decade was removed from the early part of the 20th century. Suddenly the 1960-1988 warming rate was 50% larger than the 1880-1940 rate. Maybe that seemed like a good thing, because by 1999 (row 3) another 0.019 C of warming disappeared. So by 1999, Earth had warmed <strong>twice</strong> as fast in 1960-1988 as it had in 1880-1940. And that NGO-auspicious rate extended right through to 1999. 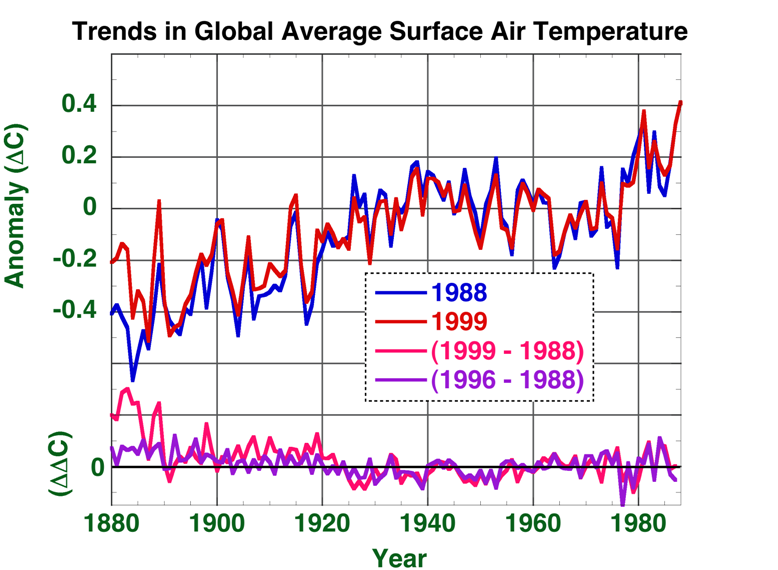 Figure 2: The GISS global average annual surface air temperature trends as published in 1988 and 1999. Blue fitted line: the 1880-1940 trend in 1988. Orange fitted line: the 1880-1940 trend after the 1999 GISS adjustments to the data. Pink fitted line: the 1960-1999 rate. This line passes nicely through the 1988 anomalies, too. Figure 2 shows the effect visually. The blue and the pink lines are the fits to the pre-adjustment temperatures. They’re nearly parallel. So in 1988, the warming rates for 1880-1940 and 1960-1988 were pretty much the same. Table 1 says they probably were the same in fact, within the limits of error. It’s pretty clear that in 1988 one couldn’t claim the late 20th century was warming more rapidly than the early 20th century. But one could make that claim by 1999. Honestly? Is enhanced late 20th century warming the explanation for GISS adjustment changes after 1988? I don’t know. But we do know that the post-1988 adjustments ended up helping the cause of the adjuster. It gets a little stranger than that, though. I then checked the GISS 1999 trend versus the GISS 2007 and 2010 trends. Lo, graves opened and miracles walked the land. Figure 3 shows the GISS 1999 and 2010 surface air anomaly trends. Once again, not so very different, visually. But at the bottom of the Figure, take a look at the 2010 minus 1999 difference. Figure 3: The GISS global average annual surface air anomaly trend as published in 1999 and 2010. Below, the blue line is the 2010 minus 1999 difference. The orange line is a cosine fit to the difference. The miracle of climate change science is that while certain 20th century climate phenomena were strangely invisible in 1999, they are clearly made manifest in 2010. 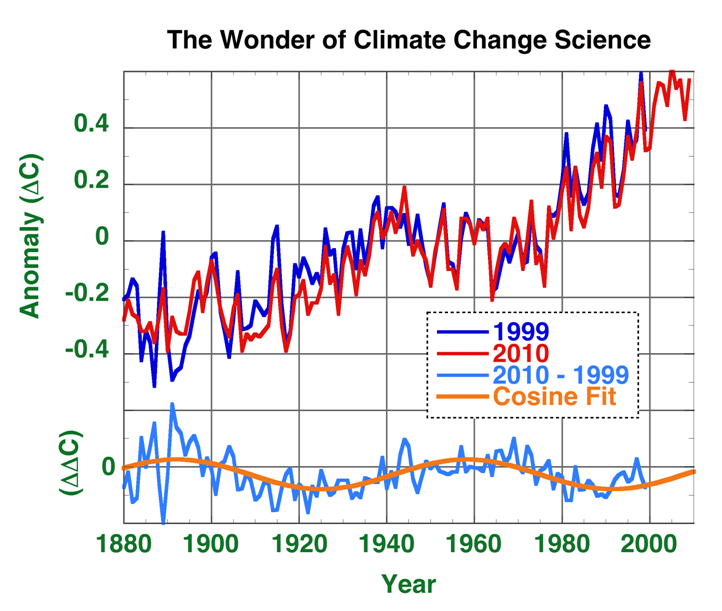 The same cosine difference emerges from the land of the miraculous into the GISS 2007 global air temperature data set, too, so we know it entered the 1999 data before 2007. Sometime between 1999 and 2007, a temperature cycle appeared in the GISS global average surface air temperature anomaly trend. The sinusoid accounts for the entire significant difference between the 1999 and 2010 anomaly trends (someone is still playing with 1880-1890, though). I got an excellent fit to the 1999-2010 difference anomalies using an arbitrary cosine function. The period is 66 years; not a religiously significant 66.6 years more’s the pity. Sixty-six years is a strange cycle. It’s a little short for the Gleissberg cycle (60-150 years ) and doesn’t seem to match any of the usual http://en.wikipedia.org/wiki/Solar_variation”>solar cycles</a>.So, I did a Google search for “66-year cycle,” and the first four of the 88+ million hits were to climate blogs. Luboš’ <a href=“http://motls.blogspot.com/2011/03/is-there-66-year-cycle-in-temperatures.html”>The Reference Frame was the top hit, and he provided a good entry into the discussion. It seems Tamino blogged about a paper that described a 66 year cycle found in 8000 ice-core years of the Atlantic Multidecadal Oscillation. Tamino was skeptical and Luboš agreed, but the AMO isn’t the global average surface air temperature record, and so that’s that. We have no idea what that miraculous new 66-year anomaly cycle represents. Maybe newly perceived AMO teleconnections? More to the point: what legitimate adjustment strategy puts a sinusoid into the global air temperature anomaly trend? Is it going to be ‘discovered’ next time someone does a wavelet analysis of the instrumental record? Notice that the periodicity didn’t visually change the global temperature anomaly trend very much. Here’s what it does to the early and late 20thcentury temperature trends: in 2010, the sinusoid reduced the 1960-1999 warming rate to 20% below the rate in the 1999 data set, but reduced the 1880-1940 trend by 33%. Table 3 gives the numbers. So, the sinusoidal result is that by 2010, the late 20th century warmed 2.8 times faster than the early 20th century. In 1999 the 20th century late/early warming ratio was 2.3 times. So, the sinusoid has the same effect as lowering the 1880-1900 temperatures: it enhances the disparity between the rates of early 20th century warming and late 20th century warming. But it doesn’t baldly steepen the trend lines themselves. The effect is pretty subtle. That change is, incidentally of course, convenient for those looking to detect an unprecedented anthropogenic change, but we all know that scientific results are indifferent to human desires. But maybe the sinusoid is really there, and the primitive pre-2007 adjustment methods accidentally removed it. So, I decided to check analogous data sets published by the Climate Research Unit (CRU) of the University of East Anglia. If a temperature cycle could be revealed using the advanced algorithms of the 21st century, surely the CRU 2005 minus CRU 1994 difference temperature anomalies should show it, too. Is there a 66-year temperature cycle that appears only in later CRU data sets? Figure 4 has the answer: there’s not a hint. We’re left to wonder what GISS had in mind. Figure 4: The CRU global average annual surface air anomaly trend as published in 1996 and 2006. Below, the blue line is the difference between these trends. The orange line is a linear fit to the difference anomalies. No cryptic sinusoid there. The fit y-intercept at 1860 is at -0.036 C.
Still, it’s interesting to see that the CRU 1994 data set was cooler than the CRU 2005 data set, prior to about 1940. In 2005, the UK Meteorological Office had replaced CRU in producing the British global surface air temperature anomaly data. So I thought maybe the Met had changed the adjustment method a little. But the same pre-1940 coolness was present in the 2003 temperature anomalies, too, and that data set was exclusively a CRU product. So, whatever’s going on, the UEA CRU and the UK Met crew were using the same adjustments to cool the pre-1940 temperatures. What did that do to the early-century versus late-century anomaly trend rates? Table 3 shows us: virtually nothing. But the post 1994 CRU adjustment did increase the total anomaly trend from 1880 to 1993 by about 0.01 C per decade. The CRU trends also reveal something interesting about the GISS trends: adding the sinusoid to the GISS 1999 anomalies brought their 2010 trends right into line with the CRU trends. A happy accident? I don’t know. So, after all that, we’re left with more questions than answers. But the new science of climate change is clear in outline: it’s gone from the study of climate to a studied climate. 1. Frank, P., Uncertainty in the Global Average Surface Air Temperature Index: A Representative Lower Limit, Energy & Environment, 2010, 21 (8), 969-989; freely available by the generosity of Multi-Science http://meteo.lcd.lu/globalwarming/Frank/uncertainty_in%20global_average_temperature_2010.pdf.”>here</a>. 2. Hansen, J. and Sato, M., GISS Surface Temperature Analysis, Goddard Institute for Space Studies, NASA, http://data.giss.nasa.gov/gistemp/graphs/, Last accessed on: 2 April 2011. 3. Jones, P.D., Osborn, T.J., Briffa, K.R. and Parker, D.E., Global Monthly and Annual Temperature Anomalies (degrees C), 1856-2004 (Relative to the 1961-1990 Mean), CRU, University of East Anglia, and Hadley Centre for Climate Prediction and Research, http://cdiac.ornl.gov/ftp/trends/temp/jonescru/global.txt, Last accessed on: 27 November 2010. 4. Hansen, J. and Lebedeff, S., Global Trends of Measured Surface Air Temperature, J. Geophys. Res., 1987, 92 (D11), 13345-13372. 5. Hansen, J. and Lebedeff, S., Global Surface Air Temperatures: Update through 1987, Geophys. Res. Lett., 1988, 15 (4), 323-326. 6. Hansen, J., Ruedy, R., Sato, M. and Reynolds, R., Global surface air temperature in 1995: Return to pre-Pinatubo level, Geophys. Res. Lett., 1996, 23 (13), 1665-1668. 7. Hansen, J., Ruedy, R., Glascoe, J. and M. Sato, M., GISS analysis of surface temperature change, J. Geophys. Res., 1999, 104 (D24), 30997–31022. 8. Parker, D.E., Jones, P.D., Folland, C.K. and Bevan, A., Interdecadal changes of surface temperature since the late nineteenth century, J. Geophys. Res., 1994, 99 (D7), 14373-14399. 9. Jones, P.D. and Moberg, A., Hemispheric and Large-Scale Surface Air Temperature Variations: An Extensive Revision and an Update to 2001, Journal of Climate, 2003, 16 (2), 206-223. 10. Hansen, J., Fung, I., Lacis, A., Rind, D., Lebedeff, S., Ruedy, R., Russell, G. and Stone, P., Global Climate Changes as Forecast by Goddard Institute for Space Studies Three‐Dimensional Model, J. Geophys. Res., 1988, 93 (D8), 9341-9364. 11. Ma, L.H., Gleissberg cycle of solar activity over the last 7000 years, New Astronomy, 2009, 14 (1), 1-3. This entry was posted on May 8, 2011 at 8:27 am	and is filed under Uncategorized. You can follow any responses to this entry through the RSS 2.0 feed. You can leave a response, or trackback from your own site. Very well done, Jeff. Coyness aside, are there attempts that you have seen to explain the disparities? This is another piece in the emerging pattern of a tyrannical world government championed by an unholy alliance of world leaders with leaders of science and the news media: Al Gore, the UN’s IPCC, the US National Academy of Sciences, the UK’s Royal Society, the Norwegian Nobel Prize Committee, government funding agencies like NASA, DOE, NSF, NOAA, EPA, etc., once-respected research institutions and journals like Nature, Science, PNAS, Proceedings of the Royal Society, and BBC, PBS, CBS, NBC, The New York Times, etc. Most of the above are probably innocent pawns in a propaganda scheme directed by someone else. We face, not just corruption of science, but abuse of the entire scientific enterprise – from astronomy to zoology – including “hard” sciences like nuclear, solar and particle physics. The greatest danger is an emerging tyrannical world government that places little or no value on the most basic values of our free society. I do not know, but these events match Eisenhower dire predicted for the demise of science and the loss of our basic rights as members of a free society in his 1961 farewell address to the nation on 17 January 1961. Yet, in holding scientific research and discovery in respect, as we should, we must also be alert to the equal and opposite danger that public policy could itself become the captive of “A SCIENTIFIC-TECHNOLOGICAL ELITE”. Brilliant,after all it is the facts we are after, not fiction! Great job! I’ve bookmarked this page for reference! Just to be clear: what you’ve done is isolate WHEN the fix & fudge were inserted. And quantified the WHAT. And the WHO is pretty obvious. As are the WHY and HOW. I believe you meant to write warmer rather than cooler. Dead bodies. Motive. Means. Smoke curling from the barrel of a thermometer. Interesting – it may well be a coincidence, but the similarity to the the ENSO/PDO cycle is strong. Super analysis. It really points to the problems with GISS temperatures. BTW, what software did you use to digitze the data? Is it freeware? I should add to my methodological note that I interpolated the digitized data sets onto a yearly x-grid, mostly to allow differencing. #1, Tom thanks for your question. The GISS page that explains their methods is here. They refer to their 1999 paper as giving the method they still use today, apart from some small changes. So, a difference in method isn’t likely to be the source of the sinusoid that emerges in their 2007 data set. I didn’t see anything in the GISS papers to explain such a difference. But I might have missed it, so if anyone finds mention of a processing difference that might explain a new anomaly sinusoid after 1999 please post about it here. #2, Oliver, it seems more likely to me that there’s been an ideological corruption of science. Since the outcome of ideology has always been tyranny, your view makes some sense but I’d guess right now the process is more blind inchoate righteousness than an organized program. #6, Bob, you’re right. My mistake. Jeff can fix that, if he has the time and inclination. Otherwise, we’ll have to hope that our readers notice your comment. #8, Arnost, I agree it looks like a PDO cycle. It also looks like an AMO cycle, as well. But if it’s a climate cycle how did it appear in only the GISS data only after 1999? Since writing the essay, I’ve also found that one can get a nice cosine plus linear fit to the 2005 CRU and 2010 GISS data sets. The linear trends average about 0.05 C/decade, and the cosine parts in both data sets passed through their local maximum in 2008 and predict cooling until about 2025 or so. As I recall, Craig Loehle predicted something similar a few years back. #9, Nandie, I agree there’s something peculiar going on. The software I used is DigitizeIt, available here for $49. You can download it directly. Thanks for a very interesting and damning analysis. Have you looked at measures of how your cosine plus linear fit compares with a range of the “consensus” assumptions that drive the IPCC projections? It shouldn’t take many years of global cooling to kick this AGW stuff into touch, although we may be past the point where UK energy policy can recover from the idiocy of Miliband (E) and Huhne. Aren’t these small differences entirely insignificant given how large your estimates of the uncertainties are in global surface temperature measurements? #11, David there are so many assumptions that drive the IPCC consensus that I have never tried to keep track of them. Typical IPCC projections just show smooth curves of rising temps into the future, driven by their consensus assumption oabout CO2, climate, and positive water vapor feedback. I’ve already shown in my Skeptic paper that a simple equation assuming a purely linear relation between CO2 forcing (proportional to log[CO2]) and temperature is all one needs to reproduce the projections of IPCC complex climate models. It’s already been shown that AGW has no scientific base. Further analysis is really not needed. The problem is that the scientific establishment has thoroughly ignored the readly available disproof, and have gone ahead determinedly with their program. Politicians like Huhne are either ignorant and so blindly accept the establishment line or else are too cowardly to speak the truth about climate alarm. #13, Neb, you’re exactly right. Not only are the differences physically meaningless but the temperature trends themselves are lost within instrumental systematic error. But numbers are numbers, and these comparisons show that the GISS numbers themselves seem to change systematically with time, so that as years pass the later 20th century warms ever faster than the early 20th century. 2001 turned out to be a slight exception; it’s nearly the same as 1999. In fact, I’ve just digitized the GISS global temps published in 2001 ( J. Hansen, et al. (2001) “A closer look at United States and global surface temperature change” JGR 106, 23,947-23,963), and it seems that during the years 1880-1920, the climate was cooler in 2001 than it was in 1999. So, in 1999, the 1880-1940 global temperature trend was 0.06 C/decade, and in 2001 it was 0.07 C/decade. Not a big change, but why should the temperatures of the early 20th century change at all between 1998 and 2000? At best, the adjustment process seems uncomfortably fluid. The strange Figure 3 cosine feature is not in the 2001 minus 1999 difference, but it is in the 2007 minus 2001 difference. So, we can narrow the time frame of emergence: between 2001 and 2006. So sometime in the early 21st century, a cosine-like cycle appeared in the anomalies of the 20th century; according to GISS. Natural climate variability, was it, that 20th century cycles should only appear in the 21st century? I think you nailed it with the two slope comparisons, 1880 to 1940 and 1960 to 2000. Only the difference in the two slopes can be attributed to CO2, with natural variation being the underlying slope. Since there is very little difference between the two slopes, CO2 creates very little difference. This is an excellent and AGW cult damning piece of work. It should be on the front page of newspapers. It would be interesting to see how the elevation of 1880 has increased the pre 1880 rate of warming when anthropic CO2 production was much lower. 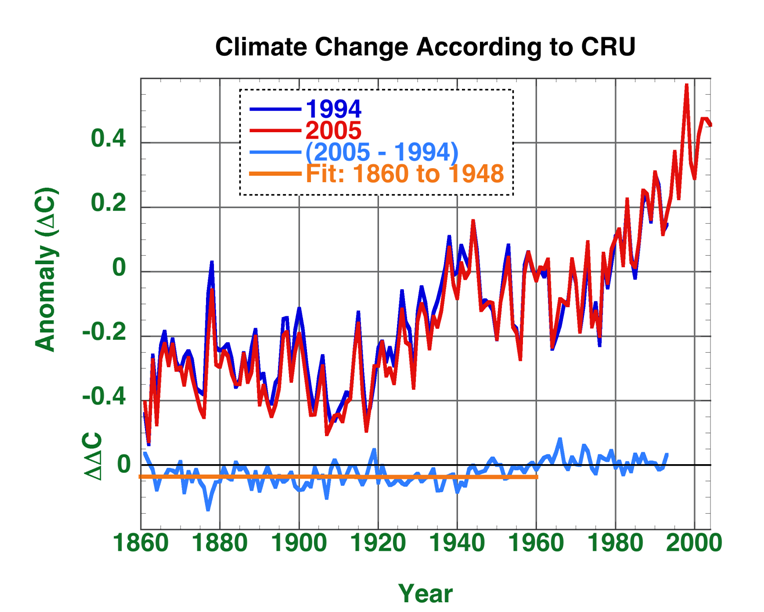 By eyeball, the CRU trend from 1880 to 1940 looks like about 0.06 degrees per decade. So the 1996 and 1999 changes to GISS brought the earlier temps into agreement with CRU. Maybe GISS got access to some of CRU’s data from a century ago. Maybe someone comparing the two pointed out an error in GISS’s calculations that they corrected when they published a new paper. It’s hard to see this as evidence of a conspiracy or cult. It could be evidence of confirmation bias – need to see what changed in the input data between 1988 and 1996, what changed in the data manipulation, what accounts for the change in temps for the 1880s. Pat. Many things changed in gistemp from 1988 on. 1. the source data changed. 3. stations in the database changed, some notable ones in the early 20th century. These were removed because they exhibited artifacts that are typical for things like broken sensors. 4. the algorithm changed substantially. I basically agree with Pat on the fundamental issue here… one can ask the question “is the temperature trend from 1970-2000 statistically different than the trend from 1905-1945”, and the answer I come back with is “no”. The difference between these two trends is 0.0008 ± 0.0031 °C/year You don’t need to work very hard to determine that this isn’t statistically significant. You can find the graph of my comparison here. 1) There is a big ENSO event around 1915. Ideally, you’d probably want to fit for this (and the 1998 event) before fitting to the trend. Quite possibly the 1910-1945 trend would be higher than the 1975-2010 trend were this “large scale climate noise” corrected for. 2) Short-period autocorrelation has been corrected for in the estimates of the uncertainties. However, the quoted uncertainties are probably smaller than systematic error. One guess is that UHI is probably more important now than in the early part of the century (the effect on trend seems to be the biggest during industrialization of an area, and certainly a larger fraction of the globe was industrializing in 1975-2010 than 1910-1945). 3) Interval selection: I wanted to use the same number of years for both periods, and circa 1975 is considered by the IPCC to be the start of the AGW forced warming. (According to this figure, until circa 1975 we need not invoke AGW forcing to explain the observed change in global mean temperature). I think it’s clear from the figure linked above, that I performed no particular “cherry picking” to get these values. 4) If you use GISTEMP (which I don’t feel is a better reconstruction because of the large amount of what I view as unvalidated manipulations of data), the different is larger: 0.0048±0.0031. This gives a p value of 0.13…still way off being statistically different. And it’s a coincidence that those changes allowed Hansen to make the kind of statements that he wanted to make about an anthropogenic fingerprint? Yes, a bunch of things changed. If they had not changed, there would not be changes. 1. Source data changed. – Not sure what to say about this one. 2. Adjustments to the source data changed. – Yes, goal-oriented adjustments look to be a major problem. 3. Stations in the database changed. – Yes. Stations were mainly dropped from the record. Why were stations dropped from the record? It was not because they were poor quality stations, but there has been no station quality control. Again, it has the appearance of being goal-oriented. 4. Algorithm changed. – Isn’t this just another way of saying the adjustments changed? Goal-oriented changes to the algorithm is the problem. Like Hansen’s answer to the Y2K problem, Hansen did not document changes to the algorithm or reasons for the changes. He just makes the changes and posts the results. Pat has put together a fine description of the effect of Hansen’s changes. A defense of these changes may exist, but it is not transparent. Your comment did nothing to help Hansen’s standing. Yes it has, but I don’t think the more complex algorithm (thinking in particular about the way they do their area weighed average) is necessarily better. I think spending too much time on motives isn’t helpful here (it’s a very subjective activity). Everybody has motives, but in terms of scientific method, the question is whether the changes to GISTEMP have been fully validated and justified and not whether they could be in principle. This is something that can be addressed in an objective and analytic fashion. But the entire basis for the 99 % certainty Jim Hansen swore to before Congress rests on canonizing 1951-1980 as the definitive bench mark of natural variability for the last several thousand years of Holocene climate. 1. I thought in Hansen’s 1988 published paper he used 1958-88 as the benchmark and that this had two significances:it was the 30 years climatic standard and in 1988 we had for the first time 30 years of Keeling CO2 measurement. 2. Where is this 1951-80 bench mark used? Is that the zero line in the GISS global surface temp graph? 3. Hansen’s Testimony to Congress – I have never been able to find a transcript…can anyone help? Motive, opportunity, conformance to a pattern of behaviour (hide the decline/tree ring selection/climate gate), conformance to an objective (AGW – Cult Cargo), sure it’s evidence albeit circumstantial but another brick in the wall. Raw data was 100 years old thermometer readings. Adjustment of such data 100 years later smacks of opportunism not scientific method unless they can point to say a batch of ACME Inc Thermometers that read 0.2 deg C low for a short time before being replaced. Things happen for a reason and when those things happen in the scientific, academic sphere to historic data they need to be explained and justified, not 10-20 years later be noticed because someone digitises the graphs and spots the pattern of changes. Hide the decline, now Hide the increase could become a slogan. Of course I’m keen for a valid scientific explaination of what happened and why the data changed, then it goes away as circumstantial evidence unless it justifies the removal of just the word circumstantial. Excellent analysis and your explanation is exceptionally clear and powerful. It’s simply so obvious what GISS has done. Hansen should be ashamed. As you suggest, taking ENSO into account brings them closer. I suspect that adjusting for volcanic forcings would bring them closer still, considering the amount of large volcanic activity that occurred in the early part of the 1975-2010 warming period. Unfortunately, in my recent regression tests, correcting for these events did not seem as clear cut as for ENSO. I have heard it suggested that solar forcing accounted for climate trends in the early century, but that this association does not hold for recent trends. What happens when you throw solar into the mix Troy? I’ll check this out myself when I get time but if you have a script already to go maybe you could run it for fun? roy, thanks for the followup… using your numbers I get 0.0010±0.0039 °C/year (no ENSO correction) and 0.0007±0.0029 °C/year (ENSO correction) for the difference in trends. I think it would be somewhat difficult to correct for volcanic aerosols, because—as I understand it—the aerosol releases aren’t very well characterized, and their influence depends greatly how far into the atmosphere they extend after the eruption. At the bottom of Figure I plotted the difference in the trends: 1999 minus 1988, and 1996 minus 1988. #21, Steven, from 1987 through 1996, Hansen and GISS used the Monthly Climatic Data of the World (MCDW) data set, and used the same processing methods described in Hansen and Lebedeff, 1987. In 1996, Hansen, et al., discuss SSTs but didn’t include them in their 1880-1995 anomaly data set. In 1999, Hansen, et al., combined GHCN data with MCDW data into a single set, but used the same data cleaning and processing methods as before. The 1988, 1996, and 1999 data sets I show here are all restricted to land-surface station data. So, all of the differences between the 1988, 1996, and 1999 data sets are real. Whatever choices they made to combine the various stations ineluctably resulted in steepening the difference between the 1880-1940 warming and the 1960-1988 (-1996) (-1999) warming. In the same 1999 paper, however, Hansen reported combining SST data into his land-station data set. He discussed the differences between the GISS SST+land and GISS land-only trends. Hansen plotted his land+SST data only as 5-year means, rather than annual means, and so in digitizing the published data sets I didn’t want to bother with those. However, to follow up in detail, tonight I digitized the land+SST plot (Plate 3b) from GISS 1999, and lo-and-behold, the difference between the 1999 land-only anomalies and the 1999 land+sea anomalies shows the same residual periodicity as the 2010 minus 1999 (and only) anomalies shown by the blue difference line (and cosine fit) in my Figure 3. After 1999, GISS included SSTs in their global data set, and also switched to using the GHCN land surface station data. So, it seems that the residual periodicity entered the data set with the SSTs. This looks to be a clear signature of air temperature oscillations arising from the net thermal phase changes in the world ocean. It’s interesting that Plate A1b in the Appendix of the GISS 1999 paper showed the [CRU 1999] minus [GISS (land-only) 1999] difference anomalies. CRU had included SSTs in their global data and the (CRU 1999 minus GISS(land) 1999) difference showed the same residual periodicity as I show in Figure 3 for GISS 2010 minus GISS 1999. But this periodicity between the data sets is passed over in silence by Hansen, et al., 1999. After all that, I now understand something more about the time-wise changes in the GISS global air anomaly data sets. It remains true that every shift in methodology of station choice between 1988 and 2010 ended up making the late 20th century warming appear ever larger than the early 20th century warming. That was the original message of my post, and there is no reason to change it. 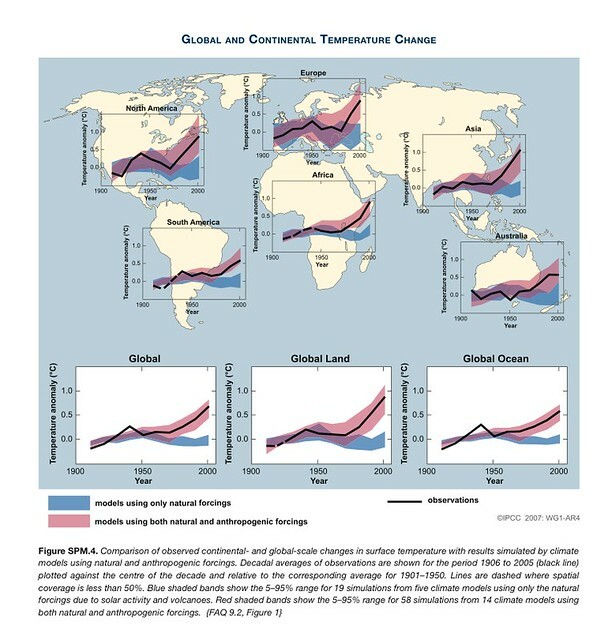 Some other interesting things came out of this extended examination of published global temperature trends, which might be the subject of another post (Jeff willing). Here is a link to the sunspot counts for the two periods. Based on where the start and end points fall within the cycles, a linear trend fit to the 1910-1945 period shows a slight increase in solar activity, whereas the 1975-2010 period has larger decrease. I’m doubtful that the slight increase in solar forcing shown could be primarily responsible for the warming in the early century, unless there is a better indicator for solar forcing or something else going on. Regressing on that 1910-1945 period with ENSO and sunspots suggests an effect of .00030 or.00042 C/sunspot. For a 0 or 1 month lag (which would be consistent with other regressions) it is that lower value, which if I convert using a simple .0082 W/M^2 of TSI per sunspot, suggests an effect of .037 C/(W/M^2 of TSI), which seems more reasonable according to S-B and in line with models than the regression of the 1975-2010 period. But either way the factor is relatively small, and in my post I expressed my doubts about the ability of a regression to accurately determine the “true” coefficient for such a small factor in the noisy temp dataset. which I believe yields a difference of about .0012 +/- .0028 C/year. But, as I mentioned above, I believe the volcanic forcing from 1975-2010 probably outweighs the solar forcing, which is why in the regressions in my post I never included the solar without attempting to include that stratospheric optical thickness. Hansen should be a lot more than ashamed. At the very least he should be fired from NASA for such a gross perversion of public resources. I think there are criminal aspects to this as well. This is fraud. Thanks Troy. It would seem that if solar is at all responsible for climate warming during any period, that the mechanisim is not direct atomospheric forcing. That’s the third paste of the same post. Care to try for 4? 5? 100? Correction; Greasemonkey and the CA script are messing with my numbers. That’s the May 16, 2011 at 11:19 am post. #26, Berniel, GISs has consistently used 1951-1980 as their normal period; the anomaly mean of those years provides the zero in their 20th century anomaly plots. You can get one version of James Hansen’s 1988 testimony here (3.9 mb pdf download). #29, Scott, I’m not implying motive. I’m really only showing trends in GISS outcomes. Notice the explanation in post 37 for the previously mysterious (to me) difference sinusoid plotted in Figure 4. It’s clear now this came from addition after 1999 of the SSTs into the GISS global anomalies. There’s nothing suspicious about that. #40, Jeff, be careful. There may have been good reasons for the changes (apart from adding the SSTs). All I’m pointing out is that they invariably made the later 20th century warm faster than the early 20th century. the cycles only fit requires a 313 year cycle of large amplitude. In both cases TSI is incorporated as a filtered version of the actual TSI. It has a minimal effect but does improve the curve fit. Both plots “predict” the future to at least 2060!! It is very interesting keeping an eye on this sort of thing. The analysis is intriguing. It is worth noting that such a cosine is present in the data, although not that dominant. This definitely looks artificial to me. I have done some work on rate of change of hadSSTv3 and there is a strong 60 year cosine with a peak around 1925. This could possibly be linked to PDO cycle. Similar cycles were shown in Scafetta (2009) which suggests >50% is natural cyclic changes. This makes the GISS adjustment all the stranger since a cosine in dT/dt trend would translate to a sine in the temperature record. Since the magnitude of this adj cosine is not insignificant in relation to trends being studied, it is an important change. One of the key discussions is how much is human induced and how much is natural variability. Now if there is a definite cyclic trend (that cannot be AGW) then adding in a 90 degree shifted version would screw up any correlation that may otherwise be found. One outcome of this adjustment will be to mask the 60 year cyclic component in the signal. cosine(2*pi*60) – small % of 1994 record to make it look related, plus a bit of random noise to stop it being too obviously hand-made if Steve McIntyre starts digging into it. Perhaps Hansen et al need to explain the algo that produced this adjustment. OK , I’ve just seem #37. Seems most of this is due to using totally different data sets. The main surprise is that it changed to little. First, about Hansen’s publication. In 1989 Solow and Broadus (Climate Change vol. 15, p. 449) criticized his assignment of carbon dioxide as the cause of warming. The only way it could be the cause, they say, is if you assume that every observed temperature increase is caused by carbon dioxide which is an absurdity. To my knowledge this criticism has never been answered and is studiously ignored by warmists. Now a few notes on the temperature graphs that you show. First, since 1979 satellites have been measuring temperatures and their values do not agree with NASA, NOAA and Met office temperature curves. The really major problem with these three temperature sources is the rising temperature segment after 1980 which is cooked. That rise simply does not exist. To fix the graph the mean of all these peaks before 1998 should be brought down to the 1951 to 1980 mean. And the super El Nino of 1998 and the 21st century high that follows should likewise be brought down by an equivalent amount. They also show a crazy World War Two warming that did not exist. There was a huge temperature drop in the winter of 1939 to 1940 and the cold persisted throughout the war and the early postwar period. New Yorkers still remember the blizzard of 1947 that completely shut down their city for two weeks. This is a distinct climate event and must not be smoothed over or averaged in with neighboring regions. In general there have been several recognizable climate events that people get rid of by averaging. First, there are long term trends. They include cooling from 1877 to 1910, followed by warming from 1910 to 1939. They are almost equal in temperature change and drawing a straight line through both of them is just plain stupid. Postwar trend from 1950 to 1975 is another almost horizontal trend. And then there is the late twentieth century warming from 1977 to 1997. And the twenty-first century high from 2001 to 2007. For the last two, use satellite values and dump ground-based data – they are cooked. Leave out 1940-1950 which is the phony World War Two warming. Leave out 1976 because that was the year of the great Pacific temperature change that supposedly boosted world temperature by 0.2 degrees. And leave out 1998 to 2001 as the super El Nino and its aftermath. None of the time periods used to calculate the decadal warming rate must cross the boundaries of these regions but unfortunately they all do in your two tables. This makes the results meaningless. As to the cosine fit, I have no clue. I think it reflects their own guess of the best way to improve their presentation. I myself am inclined to reject any and all such “improved” temperature tables. Looking at the overall picture, all the sharp peaks in the record are El Nino peaks. Their actual shape is rounded when looked at under higher magnification. The valleys in between are La Nina periods because both are phases of the ENSO oscillation which generates them. ENSO has existed since the Panamanian Seaway closed and the present pattern of currents was established in the Pacific. They would be sinusoidal if it wasn’t for oceanic disturbances during the two years it takes an El Nino wave to cross the ocean. The phase, amplitude, and frequency are all disturbed by these oceanic influences as long-term temperature curves show. Their normal period should be about four-five years and amplitude approximately half a degree, judging by the satellite data. They can be recognized as far back as 1850 which is both amazing and gives us confidence that the older records are real. Knowing their exact locations is important for evaluating the effect of volcanoes on climate. So far I have not found any volcanoes whose effect overrides that of ENSO. But that is another story, so let’s stop here. Well can’t say I’m surprised . . . if they can disappeared the MWP, a simple lowering of some temperatures is easily within the capability of even these Climate Data Changing Scientists.